Over/Under: Under 163.5 at 1.90 Bet Now! We are into 2017 but more importantly for the Euroleague, we are into the second leg of the regular season. Things start in an exciting manner with an Istanbul derby to look forward to on Thursday night. 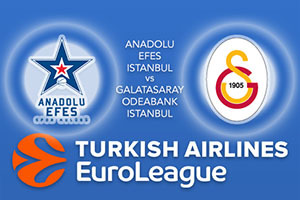 The game is played in a venue that both sides share but it is a home game for Anadolu Efes, with a 7-8 record and they play host to Galatasaray, who have a 4-11 record coming into this game. While these two sides know each other inside out, they have played three times in the Euroleague with Efes holding a 2-1 lead at this point in time. One player the home fans will be pinning their hopes on is Derrick Brown who has had an impressive campaign so far. He has notched an average of 13.7 points per game while also chipping in with an average of 6.7 rebounds per game. Thomas Huertel has also been a key player for the hosts and he has provided an average of 12.9 points per game and an average of 5.7 assists per game. Bryan Dunston has also been in good form, hitting double figures with an average of 10.2 points per game. These are the players that are likely to tip things in the balance of the hosts in this game. With the third best offence in the league, Efes can make things happen where it matters. There have been a few changes for Galatasaray recently, with Deon Thompson leaving the club while Bruno Fitpaldo coming in. Sinan Guler has played a captain’s role of late, offering an average of 10.5 points per game and an average of 5.7 assists per game. Austin Daye, with an average of 10.1 points per game and Alex Tyus, with an average of 10 points per game and 5.5 rebounds per game have also played their part for Galatasaray. When the teams clashed in the Euroleague earlier this season, Efes won by 10 points with Brandon Paul offering 19 points in the win. However, Blake Schilb was on fire for Galatasaray, offering 21 points. Take Anadolu Efes Istanbul at -8.5, at odds of 1.90 and if you’re looking for the Over/Under market, go UNDER 163.5 at odds of 1.90. Bet Now!